Friends, there’s a crisis amidst, one that I’m horrified to say, is getting scant media attention. It’s much bigger than Herman Cain’s did-he-or-didn’t-he tabloid headlines, which have been replayed over and over again on the nightly news. (Curse you, Brian Williams!) I assume, of course, they’re referring to whether Cain ordered his pizza with, or without, pepperoni. Price of peanut butter has just gone up as much as 40%. Why, you ask? Because the future of Mr. Peanut is in jeopardy. So hold on to your monocles and listen up! The price of peanut butter just skyrocketed, smack though the roof of my peanut butter-laden mouth. Up by 40 percent, which means you’re going to have to start shelling out a lot more, just for one jar of peanut butter, crunchy or smooth. It’s as if Mr. Peanut has been kidnapped and now we have to pay the ransom. The reason? Part of it has to do with peanut production being down 13 percent. The rest can be blamed on intense heat and drought in the south. Couple that with demand. 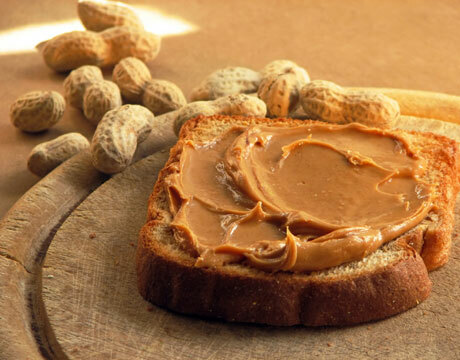 The National Peanut Board says Americans spend almost $800 million a year on peanut butter, consuming six pounds of it per year! 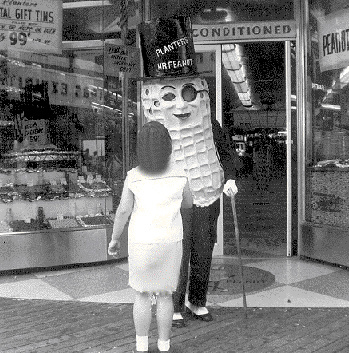 And if anyone knows peanuts, it’s the Peanut Board, which I assume is run by Mr. Peanut, himself. Given the bad news, I’m on the prowl for a recipe for homemade peanut butter—preferably one that doesn’t involve using peanuts. You see, I’m addicted to the stuff, which, to me, is as American as hot dogs, apple pie and waving the red, white and blue. 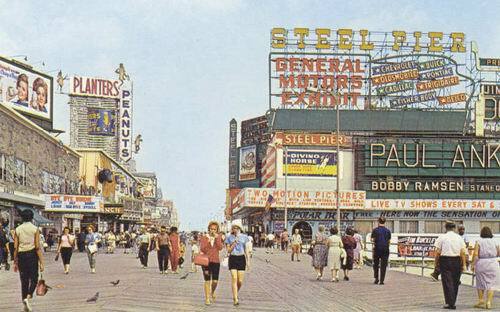 Mr. Peanut talks to a young fan in Atlantic City, circa, a long time ago. I bid you farewell. I’ll never forget our time together, nor how we met. It was when my mother first brought home a jar of peanut butter from the A&P. Sure, she purchased a generic brand then, but she didn’t know any better. She hadn’t seen the countless commercials I got to watch daily, in between The Flintstones and Bugs Bunny cartoons. How I grew to love those ads that exulted your amazing attributes, all determined to convince me that they had the “peanuttiest” tasting peanut butter. According to one manufacturer, my mother clearly wasn’t a choosy mom, which probably meant she didn’t love us, kids, as much as other moms loved theirs. At least, that’s what the commercials wanted me to believe. But, what can I say? She was from Venezuela, where peanut butter isn’t nearly as popular, and she didn’t yet know about America’s love affair with the peanut. Oh, Mr. Peanut! I learned early on that adding peanut butter to any product was a guarantee it would become an instant hit with my family. Items like Cap’n Crunch Peanut Butter Cereal, and Nutter Butter cookies, which boasted, “Made with real peanut butter,” were scrumptious! Later on, we discovered Little Debbie Nutty Bars and Drakes’ Funny Bones, a chocolate cake with peanut butter filling that was sold only on the east coast. And of course, let’s not forget that long-time standby, the Reese’s Peanut Butter cup. Mr. Peanut, it didn’t get any better than that. Well, goodbye peanut butter treats, many of which I haven’t tried in years, but still remember fondly. Let’s hope the peanut farmers have a bumper crop next year. Maybe, former President Jimmy Carter can put together a delegation with you, Mr. Peanut, and all the little peanut runners, and arrange a summit with Mother Nature, to ensure we have an abundance of peanuts next season. Until then, Mr. Peanut, I will wait for you to come down in price. I’m also going to be snacking on gold bars instead. I hear their price just became cheaper than buying a jar of peanut butter, smooth or crunchy.